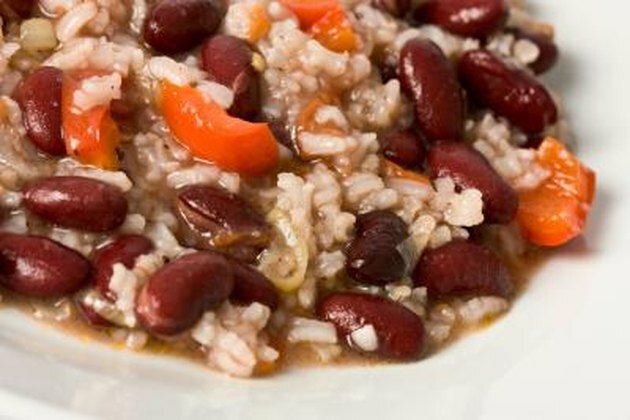 Rice and beans are both nutritious yet inexpensive foods that, when combined, form a complete protein. Your body needs protein to build and repair tissue. Proteins are made up of building blocks called amino acids. There are eight essential amino acids that your body cannot make and must be obtained from food — leucine, isoleucine, valine, threonine, methionine, phenylalanine, tryptophan and lysine. While animal sources of protein contain all the essential amino acids, plant sources lack one or more, called the limiting amino acid. According to the USDA National Nutrient Database, a cup of cooked white rice contains 4.25 grams of protein, while the same portion of brown rice provides 5 grams of protein. The limiting amino acid in rice is lysine. Beans and other legumes — also known as pulses — are nutritional complements to rice and help to complete its amino acid profile. It is not necessary to combine complementary proteins at the same meal. Just be sure to eat a variety of proteins sources throughout the day. According to the USDA National Nutrient Database, one cup of cooked beans — black, kidney, navy, pinto, small white, lima or garbanzo — provides 15 grams of protein. For beans and other legumes, the limiting amino acid is methionine. Grains like rice, corn or wheat are commonly used to complement the protein in beans. The 2005 Dietary Guidelines for Americans recommend 3 servings — or 6 cups — of legumes weekly for those consuming 2,000 calories a day. Beans are an excellent substitute for proteins that are higher in saturated fat, such as red meat. According to the Food and Agriculture Organization of the United Nations, rice provides 20 percent of the world’s energy needs. Brown rice is higher in fiber and other nutrients than polished white rice. One cup of brown rice provides 3.5 grams of fiber, primarily insoluble fiber. Brown rice is also high in thiamin, niacin and B-6. Each of these is important in energy metabolism. Thiamin plays a vital role in nervous system function, and B-6 helps you use protein to build body tissue. Brown rice is also a significant source of manganese, selenium and magnesium. Manganese is involved in energy metabolism and bone formation. Selenium aids in defending the body against oxidative stress and regulating the thyroid hormone. Magnesium helps build bones, make proteins and regulate body temperature. According to the USDA National Nutrient Database, 1 cup of cooked beans provides 245 calories, 45 grams of carbohydrate and 15 grams of fiber. Legumes are particularly high in soluble fiber, which can help lower cholesterol and glucose levels. Legumes are an excellent source of folate, which helps the body form red blood cells and genetic material. They are also good sources of thiamin and B-6. Legumes are rich in several minerals. Potassium assists in muscle contraction, maintaining fluid and electrolyte balance, nerve transmission and energy metabolism. Phosphorus helps build strong bones and teeth, metabolize energy, and form genetic material, cell membranes and enzymes. Iron carries oxygen as part of hemoglobin and myoglobin. Zinc helps form proteins and assists in wound healing, blood formation and maintenance of all tissues. Copper helps form hemoglobin and keeps bones, blood vessels and nerves healthy. Legumes are also good sources of manganese, selenium and magnesium. USDA; “Good Sources of Nutrients” Fact Sheet series; 1990.